The original cast of "The View" is seen here from left, Star Jones, Joy Behar, Meredith Vieira, Debbie Matenopoulos and Barbara Walters. Several women auditioned for the show at a hotel room in New York City’s Upper West Side. 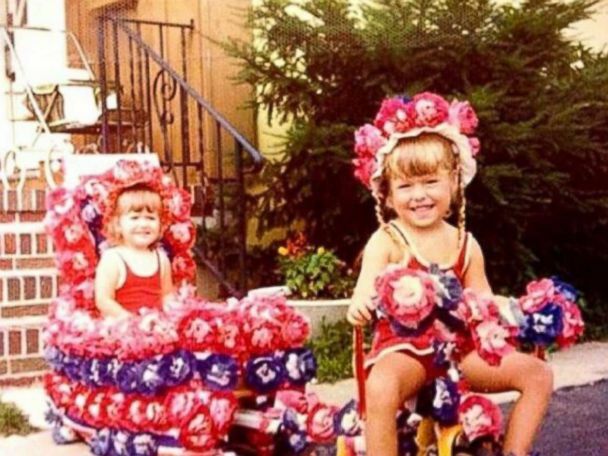 “That first group to sit down of all those women that were rotated all day long were me, Meredith, Star, Joy and Barbara,” Debbie Matenopoulos said. Tune in to the ABC News primetime special, “The View: 20 Years in the Making,” which airs on Tuesday, Aug. 23 at 10 p.m. ET. The original cast of &quot;The View&quot; is seen here from left, Star Jones, Joy Behar, Meredith Vieira, Debbie Matenopoulos and Barbara Walters. Several women auditioned for the show at a hotel room in New York City&rsquo;s Upper West Side. &ldquo;That first group to sit down of all those women that were rotated all day long were me, Meredith, Star, Joy and Barbara,&rdquo; Debbie Matenopoulos said. Tune in to the ABC News primetime special, &ldquo;The View: 20 Years in the Making,&rdquo; which airs on Tuesday, Aug. 23 at 10 p.m. ET. The original cast of "The View," is seen here, Aug. 11, 1997, when the show’s first episode aired. According to Barbara Walters and former executive producer Bill Geddie, the show struggled initially. "Barbara had to go door to door to get stations to watch us," Joy Behar said. 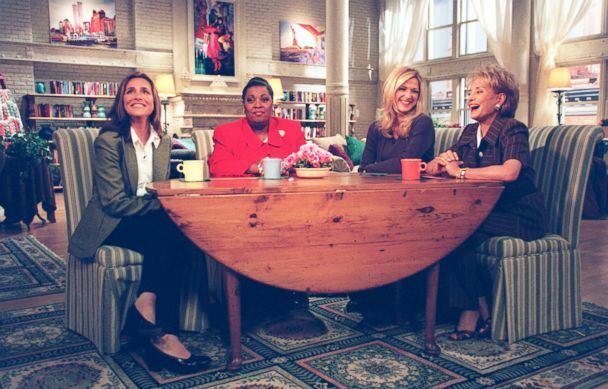 According to Walters and Geddie, the network didn't have enough faith in the show when it launched to invest in a new set, so "The View" was filmed on an old soap opera set. Shown here, Paul Simon joined hosts Meredith Vieira, Debbie Matenopoulos, Barbara Walters and Star Jones on "The View," Jan. 23, 1998. &ldquo;The View&rdquo; became a popular stop for musical acts to perform. Britney Spears is seen here on &quot;The View&quot; with co-host Lisa Ling, June 10, 1999. The popular group 'NSYNC is seen here with Lisa Ling, March 30, 2000. “I danced with Justin Timberlake, which is still one of those moments that I can't believe happened. I actually gyrated with Justin Timberlake? On national TV and it was really, really, fun,” Ling said. Donald Trump makes a surprise visit to "The View" on Sept. 10, 2003. Trump made several appearances on the show over the years. Joy Behar and Barbara Walters are seen on "The View," April 12, 2004. Michael Douglas appeared on "The View" on April 21, 2006. "My very favorite then and now is still Michael Douglas," Star Jones said. "Michael decided to make fun of my crush on him. And my face was mortified! I tell you, I've never felt more complimented in my life." Douglas made multiple guest appearances on the show over the years, often to celebrate Barbara Walters' birthday because he, Walters and Catherine Zeta-Jones all share the same birthday. Paul McCartney is seen on "The View," Jan. 14, 2009. Joy Behar and Sherri Shepherd are seen here on "The View," Jan. 29, 2010. Whoopi Goldberg cuddles with &quot;Verrazano,&quot; the 5-month-old kitten who was abandoned at the Verrazano Bridge in New York City in 2011. Former President Bill Clinton appeared as a guest on "The View," Dec. 7, 2011. Meryl Streep talks about her film "The Iron Lady," on "The View," Dec. 23, 2011. The Muppets took over "The View," March 14, 2012. President Barack Obama is shown here as a guest on "The View," May 15, 2012. The president made several visits to the show but his July 2010 appearance was historic because it marked the first time a sitting U.S. president had visited a daytime talk show. Donald Trump appeared on "The View," Dec. 12, 2012. Jenny McCarthy is seen here celebrating her birthday dressed as Sandy from the movie "Grease" with guest Olivia Newton-John, Nov. 1, 2013. Rosie O'Donnell makes her first return to "The View," Feb. 7, 2014. After serving as a moderator in Season 10, O’Donnell returned to “The View” as a co-host for Season 18. Broadcasting legend Barbara Walters says goodbye to daily television with her final co-host appearance on "The View," May 16, 2014. The Muppets join the "The View" co-hosts, Aug. 8, 2014. Shaquille O'Neal picks up Rosie Perez on "The View," Nov. 18, 2014. Rosie Perez, Neil deGrasse Tyson, Whoopi Goldberg and Raven-Symoné are seen here on "The View," March 31, 2015. Paula Faris and Michelle Collins guest co-host "The View," April 16, 2015, before being named co-hosts for Season 19. Jennifer Lopez visits "The View," March 31, 2016. “My very favorite moment was, of course, when Hillary Clinton came on ‘The View,’ [in 2003] and I famously said to her, ‘When you're ready to run for president, I'll be there for you,’" Star Jones said. Hillary Clinton is seen here on "The View" studio on April 5, 2016. Lionel Richie visits "The View," on June 18, 2016. Whoopi Goldberg, Candace Cameron Bure, Jedediah Bila, Sara Haines and Paula Faris are seen on "The View," July 14, 2016. The 20th season of “The View” premieres this fall on Sept. 6. See the TV host on set and at play.